Inventory We are a resale marketplace, not a box office or venue. Ticket prices may exceed face value. This site is not owned by Levi's Stadium . Levi's Stadium opened on August 2, 2014 as the new home of the National Football League's San Francisco 49ers. The Levi's Stadium box office is located at 4900 Marie P DeBartolo Way in Santa Clara, California. The venue was constructed for approximately $1.3 billion and has a seating capacity of up to 75,000. Levi's Stadium tickets are set to include events like Super Bowl 50, WrestleMania, PAC 12 Championship game as well as all 49ers home contests. 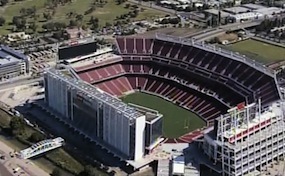 StadiumSantaClara.com is not a primary vendor, supplier, or affiliated with any official website. We proudly provide access to a large supply and low prices online for all secondary market events. Ticket prices may be well below or above face value and will fluctuate with the market. To purchase tickets for all Levi's Stadium San Francisco Events simply click on the show of interest or call our operators at anytime.